I had one of those days, craving something light, spicy and ‘seafooddy’. And, I didn’t want to spend a lot of time in the kitchen. So I examined my freezer, found a bag of frozen extra large shrimps and immediately thought of Shrimp Scampi. But I didn’t really want to get carbs involved so much either. And the Shrimp Scampi without spaghetti, for some reason, weren’t as appealing to me.Why not try something completely new? So I looked up some recipes for Creole style dishes on line. I had some idea what was that cuisine, popular in southern part of the country, about – but wasn’t completely sure what kind of ingredients it involves. I found several different ones, and liked the simplicity of the recipes. That’s what I was looking for! 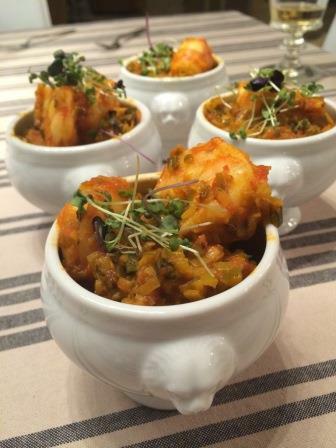 As usual, I put my own twist on it and made something I called Shrimp Criolli (inspired by Creole and Spanish cuisine combined). Let me tell you, I already made it several times, that’s how delicious it came out! My mouth is watering again, just writing about it! 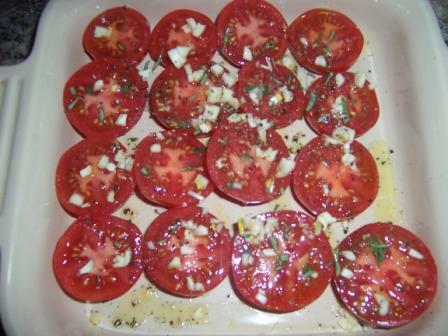 Cut tomatoes in half, line them cut side up in a small baking dish, season with salt and freshly grated pepper, chopped garlic and rosemary and sprinkle generously with olive oil. Let bake in oven at 375F for 20 minutes. 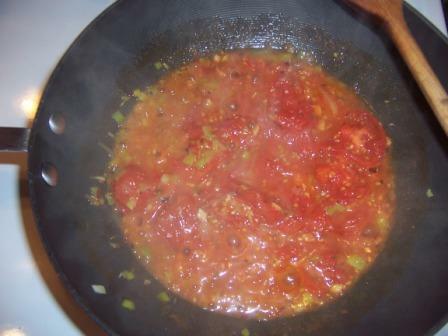 The aromas of tomatoes with the garlic and rosemary, was incredible as soon as it warmed up a little. That’s the base of this dish.In the meantime clean your shrimp, peel and de-vain if needed. In the large skillet heat remaining olive oil and tablespoon of butter, add cleaned and sliced leeks and cook on medium low heat until caramelized and soft. Add baked tomatoes straight from the baking dish with all its juices, add red flakes or hot pepper and few threats of saffron. Mix together. The tomatoes will easily brake down and release all the caramelized juices we achieved by baking it, with beautiful aromas of garlic and rosemary. Add white wine and let it cook out a little. Introduce raw shrimp to the party, so it’s covered in sauce. 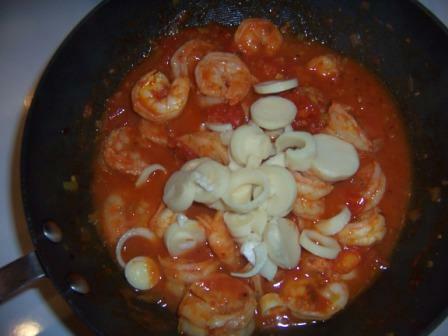 Cover the skillet and let cook on medium – low heat until the shrimp turns pink – about 5-10 minutes. Check it out frequently so the shrimp doesn’t overcook. Remove palm hearts from the jar, and wash them in colander under running water to remove salty solution they were preserved in. Drain and cut into similar pieces (rings) and add it to the sauce at the end. At that point, turn the heat off and let the palm hearts just warm up in the sauce. You don’t want your shrimp to turn into a rubber. If you don’t have palm of hearts (I bought mine in Costco), honestly, it is not really contributing to a particular flavor profile of this dish. I liked it because it added an additional crunchiness. So feel free to skip it if you can’t find it in the store. I serve this dish as an appetizer (in martini glasses or in little bread rolls) or it can be served as a main dish, perhaps with gnocchi. If you’re done watching carbs, you can serve this delicious dish over pasta, rice or with crusted bread for dipping. I had this dish with a bottle of Henri Bourgeois ‘Petit Bourgeois’ Sauvignon Blanc – a beautiful, crisp and refreshing white wine that I hadn’t have for quite some time. (look for the most recent vintage!) It was as good as always and complimented the dish perfectly. I would see Argentinian Torrontes to pair great with this or perhaps any Spanish whites, since I put Spanish twist on it! 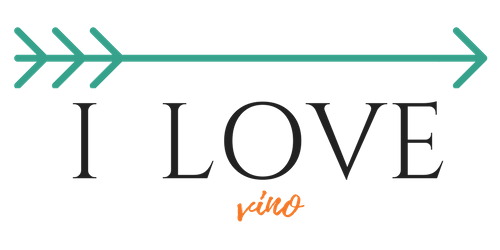 I can see my favorite Muga Blanco, Muga Rose, or any crisp whites from Rueda – like Las Brisas or Oro de Castilla to do just great. Again, if you want to try any of these wines, please look for the most recent vintage possible. Delicious! I wish I could pop by for dinner.